Home » Babies » What Is a Veiled Birth? What Is a Veiled Birth? Those who haven’t heard the term “a veiled birth” may think it refers to some sort of anomaly or disorder that occurs during childbirth. Others who are familiar with the expression may consider it to be an event surrounded by mysticism. We’ll explain what a veiled birth is in this article. Despite what you may have heard, veiled births happen very rarely and take place just like any other unusual event that may occur during childbirth. The veiled delivery has practically no effect on the mother and baby who experience it. For the doctors who witness it, however, it is something magical. When the baby leaves the uterus (usually through the birth canal) surrounded by the bag of amniotic fluid, it’s called a veiled birth. 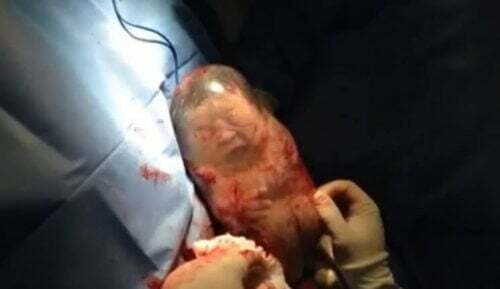 Unlike what happens in a typical birth, in a veiled birth the sac doesn’t break and those who attend the birth have the opportunity to see the baby inside the amniotic fluid, for a few seconds, as if he were still inside his mother’s womb. What other names are given to this type of birth? In addition to “veiled birth,” this type of event is known by various names in popular culture, including being born en caul, with the mantle of the virgin, with a pouch or with a scarf. The gift of being born is enough to be happy about throughout life. He who enjoys life also enjoys everything it has to offer. Is a veiled birth harmful to the baby? As long as doctors break the bag moments after birth in order to clamp the umbilical cord and stimulate breathing, the child will not suffer any danger. Any disorder that can be caused at birth could have been suffered the same way whether the amniotic sac was broken before delivery or not. Does this condition offer any benefit to the newborn? There is no benefit. It was previously believed that being born inside amniotic fluid protected the child from external pathogens for much longer, but nowadays this is considered nothing more than a myth. In addition, the baby stays in the sac for an extremely short time from the moment it is born. The veil that covers it for mere seconds doesn’t immunize it against the infections it may later get. How often does a veiled birth occur? A veiled birth is rare. Usually, the amniotic sac is ruptured before giving birth and is one of the signs that the mother has gone into labor. On the other hand, a veiled birth is more common when there is a vaginal delivery rather than a cesarean delivery. Why do some people consider this type of birth magical? Some people attribute this type of birth to a holy touch. This is precisely due to the way others feel when it occurs. It’s said that veiled births are extraordinary and incomparable events in which the beginning of human life can clearly be seen. Formerly it was believed (and some cultures still see it as such) that a baby born this way would have spiritual protection in the future, so that from that moment on he was and always would be extremely happy. However, today we know – and most believe it to be true – that a veiled birth is no more than a whim of science, a curious event that can generate superstitions and opinions of all kinds.